The Royal Opera House’s Learning and Participation programmes place creative learning at the centre of every child’s education, attainment and experience. Our online resources, written by experienced teachers, provide high quality, inspirational materials that can be adapted to all classrooms and student abilities. • Imaginative classroom creative activities based on dance and singing. • Digital resources to use in ways that suit the needs of your students. • A two-, five- or ten-week scheme of work aligned to the National Curriculum. We are pleased to announce that we will be running a teachers’ Continuing Professional Development (CPD) workshop, as part of our free programme for schools across the country. 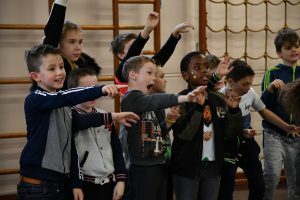 Based on Bizet’s world-famous opera Carmen, this Key Stage 1 and 2 singing project will inspire school children to engage with opera through story, character and song. This free workshop will be led by a professional opera director and vocal leader at the Royal Opera House. The CPD session will introduce teachers to the story and key characters of Carmen, using a variety of creative drama and singing exercises that will equip them to deliver the programme creatively in their schools. The session will cover five songs from the production that have been specifically adapted for a primary school audience. Through the session, teachers will be given the opportunity to explore how they can deliver the project over a two-, five- or ten-week period at their school, culminating in a performance. The Royal Opera House’s world class opera and ballet productions are brought to life on its world-famous Covent Garden stage through the amazing work of designers, artists and craft makers who create and manufacture the sets and costumes for the productions. The annual Design Challenge competition gives students from institutions across the UK the opportunity to test and develop their design skills, based around an opera or ballet production. On Friday 21 June, we will be launching the Design Challenge 2019 project. The morning will focus on the new repertoire for the 2018/19 project, and the afternoon will present a CPD full of practical activities that you can deliver with your students to support them with the project. *Design Challenge (FE) students will follow one of four pathways: Set Design, Costume Design, Marketing Strategy and Design, or Hair, Wigs and Make Up Design. *Design Challenge (Secondary) students will follow one of two pathways: Set Design or Costume Design. To register your interest in attending this CPD, please email design.challenge@roh.org.uk with your name, your school/college name and the course which you wish to deliver. For further information about our other Learning programmes, please visit our learning platform. Create and Sing is generously supported by the Stavros Niarchos Foundation, Ernest Cook Trust, David and Elaine Potter Foundation, Mohn Westlake Foundation, Teale Foundation and an anonymous foundation.